Learn how to build a fake new classifier by yourself using Natural Language Processing techniques in Python! This course will teach you all the basic technique to process and parse text. Enjoy! Pythonistas! 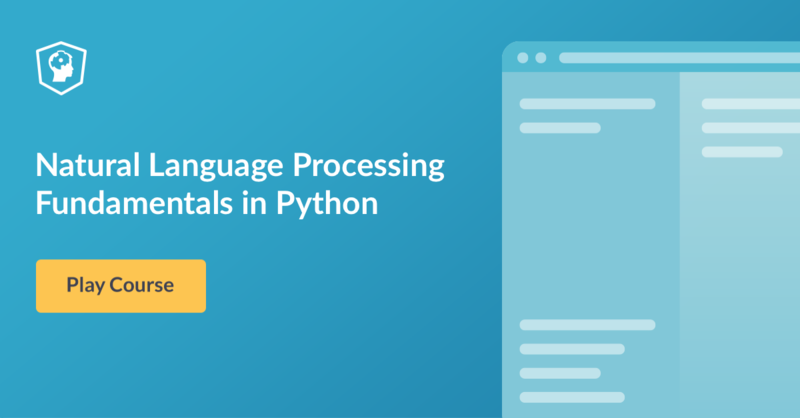 We're launching a new course today: Natural Language Processing (NLP) Fundamentals in Python by Katherine Jarmul. In this course, you'll learn Natural Language Processing (NLP) basics, such as how to identify and separate words, how to extract topics in a text, and how to build your own fake news classifier. You'll also learn how to use basic libraries such as NLTK, alongside libraries which utilize deep learning to solve common NLP problems. This course will give you the foundation to process and parse text as you move forward in your Python learning. This chapter will introduce some basic NLP concepts, such as word tokenization and regular expressions to help parse text. You'll also learn how to handle non-English text and more difficult tokenization you might find as you explore the wide world of NLP. This chapter will introduce you to topic identification, which you can apply to any text you encounter in the wild. Using basic NLP models, you will identify topics from texts based on term frequencies. You'll experiment and compare two simple methods - bag-of-words and Tf-idf using NLTK and a new library - Gensim. This chapter will introduce a slightly more advanced topic - Named-entity recognition. You'll learn how to identify the who, what and where of your texts using pre-trained models on English and non-English text. You'll also learn how to use some new libraries - polyglot and spaCy - to add to your NLP toolbox. Here, you'll apply the basics of what you've learned along with some supervised machine learning to build a "fake news" detector. You'll begin by learning the basics of supervised machine learning, and then move forward by choosing a few important features and testing ideas to identify and classify "fake news" articles. Learn all the fundamentals of NLP today!